In many call centers, callers may call multiple times. Some of the calls are re-attempts after abandonments (redials), and some are re-attempts after connected calls (reconnects). The combination of redials and reconnects has not been considered when making staffing decisions, while not distinguishing them from the total calls will inevitably lead to under- or overestimation of call volumes, which results in improper and hence costly staffing decisions. 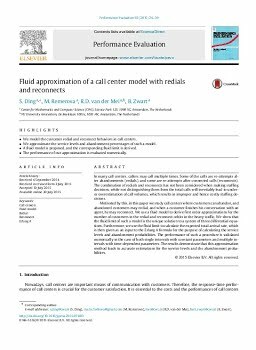 Motivated by this, in this paper we study call centers where customers can abandon, and abandoned customers may redial, and when a customer finishes his conversation with an agent, he may reconnect. We use a fluid model to derive first order approximations for the number of customers in the redial and reconnect orbits in the heavy traffic. We show that the fluid limit of such a model is the unique solution to a system of three differential equations. Furthermore, we use the fluid limit to calculate the expected total arrival rate, which is then given as an input to the Erlang A formula for the purpose of calculating the service levels and abandonment probabilities. The performance of such a procedure is validated numerically in the case of both single intervals with constant parameters and multiple intervals with time-dependent parameters. The results demonstrate that this approximation method leads to accurate estimations for the service levels and the abandonment probabilities.